Derry withstood a strong second-half rally from Wexford at Bellaghy today to maintain their 100% Allianz FL Division 4 win record ahead of next Saturday’s final against Leitrim at Croke Park. Damien McErlain’s men were pushed all the way by the visitors in this round 7 fixture but prevailed on a scoreline of 3-21 to 4-16. Ryan Bell sent over nine points for the winners and he got the scoring underway with a long-range effort inside the opening minute before Benny Heron fisted the ball to the Wexford net for the game’s opening goal in the 10th minute. Enda Lynn and Ryan Dougan also raised green flags for the Oak Leafers in the opening period and they enjoyed a 3-11 to 1-8 advantage at the break. Wexford’s goal arrived courtesy of Ben Brosnan and Kevin O’Grady added a second via the penalty spot five minutes after the resumption. Two quick fire goals from Barry O’Connor and Brosnan narrowed the deficit to the bare minimum (3-19 to 4-15) with just five minutes to go but, despite being reduced to 14 players following Conor Mulholland’s dismissal, the Oak Leafers held on to continue their winning ways. 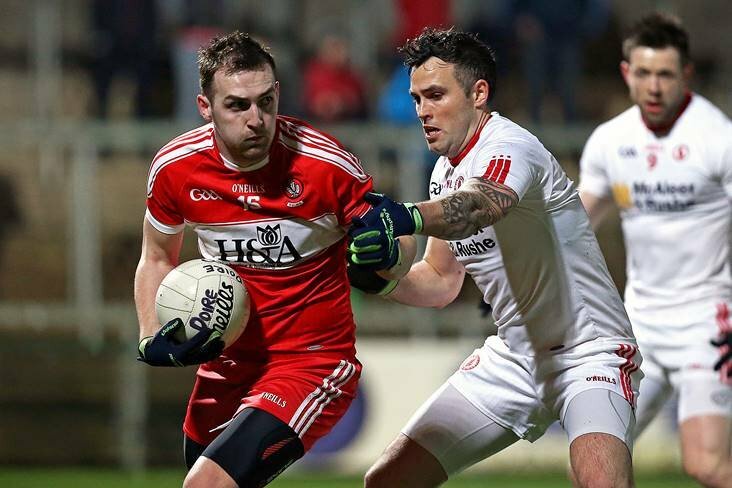 Derry - B McKinless; S F Quinn, C Mulholland, P McNeill; P Coney (0-1), E McGill, N Keenan (0-1); R Dougan (1-1), C McAtamney (0-1); C Doherty (0-2), E Lynn (1-3, 0-1f), P Cassidy; B Heron (1-2), R Bell (0-9, 3f, 2m), N Toner. Subs: C Bradley (0-1) for E Lynn, K McKaigue for R Dougan. Wexford - C Swaine; M Furlong, M O'Neill, S Barden; G Malone, B Malone, E Porter; D Waters (0-1), N Hughes; B Brosnan (2-1), J Bealin (0-10, 6f), C Devitt; B O'Connor (1-1), E Nolan, K O'Grady (1-2). Subs: G Sheehan for S Barden, J Cash for M O'Neill, T Rossiter (0-1) for C Devitt, D Shannon for N Hughes, M O'Regan for E Nolan.